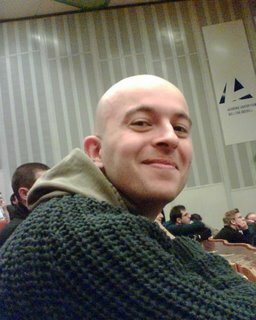 I went to the Free and Open Source Developers European Meeting (FOSDEM) in Brussels this weekend. I attended some quite interesting presentations about Plan9, DTrace and Xen. Some of these presentation were recorded, and the videos are available for free. That's me on the picture :) It was taken by a former classmate of mine, Dag, with his Nokia mobile phone.